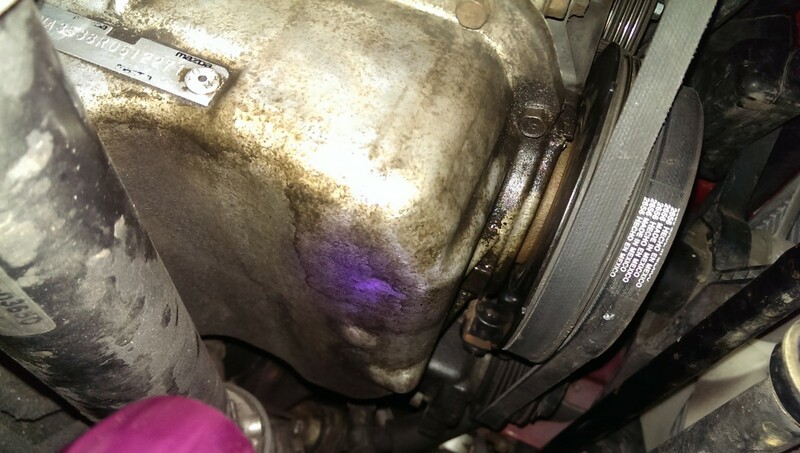 Posted 4 years ago on Friday, September 11th, 2015 by James S.
Finding oil leaks is always a pain, but UV dye in the engine oil and a UV light can make it a lot better. I find this to be a lot easier than trying to clean the engine enough to see where the oil is coming from without it. I had a few leaks from a junkyard Miata engine I dropped in, and I wanted to find the source rather than throw parts at it. This is especially worthwhile in the case of a leaking valve cover or cam angle sensor on a Miata. 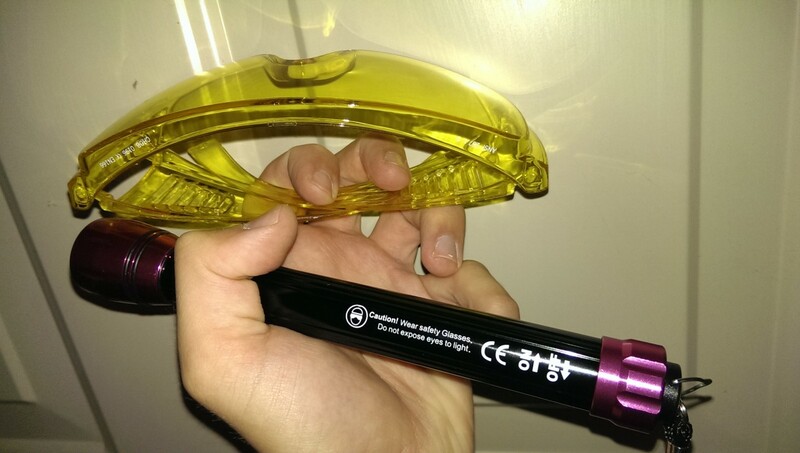 Leaks at the rear of the head can look like they’re coming from the rear main seal. Seeing as this is a difficult seal to replace, given that it requires dropping the transmission or removing the engine, and I had just put in a new one, I didn’t want to repeat that work unless I had to. This is all you need, and the dye and blacklight are available on Amazon or at any parts store. 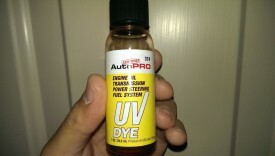 You add the UV dye to the engine oil (or other source of potential leak, such as transmission oil) and start the engine. You can then start shining the UV light around to see if the oil is leaking. 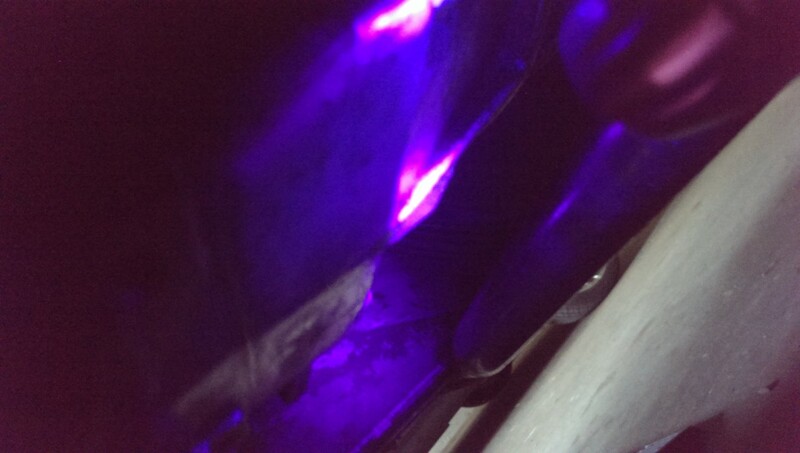 It was really hard to get a worthwhile picture, but the oil will shine very brightly with UV light in it. If you start the engine up, run it for a bit, and then shut it down, you should be able to trace where the leak is coming from very easily. If you’re extremely careful, you could also do this with the engine running, but I am not going to officially recommend that. In any case, UV dye kits are a great way to nail down the source of a leak, rather than guessing and replacing parts. I highly recommend adding the dye, running the engine, and then immediately looking for a leak. Preferably, go ahead and idle it on jack stands. If you drive the car around after adding the dye, the leaking dyed oil will spread around everywhere and make it hard to determine the source of the leak.